Gunhild Swanson with proof of her passion. Gunhild Swanson first thought about running during a conditioning class at the YWCA when she was 34. It was 1977, the year of the first Bloomsday run, and the class instructor was talking to some ladies in the class about the race and the then-new concept of "jogging." At the end of class, anyone who wanted to try it out could stay to run laps around the gym. Swanson still remembers clearly that it took six weeks before she could run the full 24 laps without walking. And she remembers it with a laugh, because that following year she ran her first Bloomsday and several years later ran her first marathon. 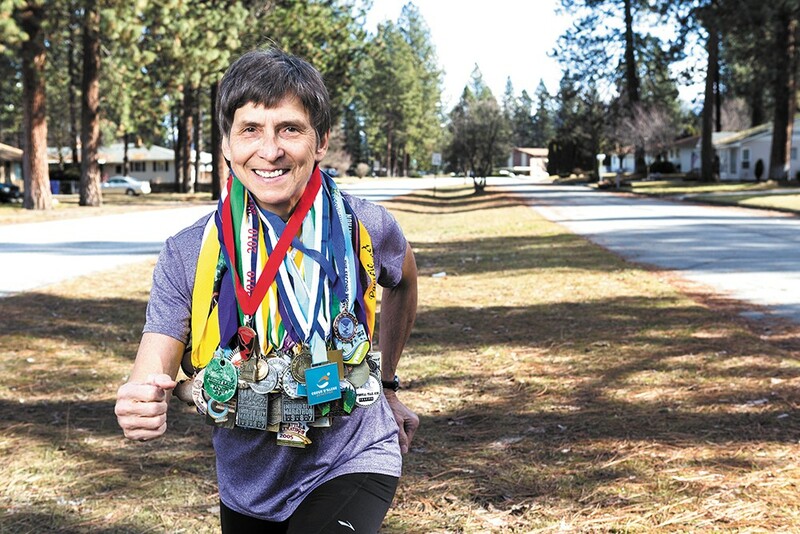 This spring, at age 69, she's running her 250th marathon. "It was love at first step, I would say," she says. "And I just haven't stopped since." It's clear that time is not kind to runners. Joints can wear out, muscle mass declines and every runner inevitably gets slower. But many aging runners, like Swanson, have found that a slower pace doesn't mean leaving racing behind. While studies have shown health benefits, including a "notable survival advantage" for runners as they age, perhaps most important, runners love running. Recreational distance running caught on across America in the 1970s, and that popularity is creating a demographic shift at the starting line. In 1988, less than 3 percent of Bloomsday runners were over 60. Last year, nearly 10 percent were over 60. Almost 1,000 participants were over 70. While many of those older runners have been putting in miles since their high school days, many others have taken up running later in life. John Shull, 62, ran in the military for years but didn't make a point of it until he was nearly 40. Then, after finishing the San Francisco Marathon, he was hooked. "You get the bug, and once you get the bug you just keep running," he says. He's now run a marathon on every continent. Shull says he's not "fast or flashy," and he runs more for the lifestyle than the competition against other men in his age group. "If I live long enough, I'll become competitive," he jokes. Physical training works the same way at any age, says Wendy Repovich, the exercise science program director at Eastern Washington University — you push your body to do more, and it adapts to do that work more efficiently. Older people may see improvements more slowly when they begin a fitness program, but a person will see the benefits of increased activity at any age. But what about the risk of injury? Repovich says the most common cause of injury is overuse — training too hard without adequate rest. "That makes no difference whether you're just starting out or you've been doing it forever," she says. Ingrid "Piper" Peterson, 67, grew up playing "girls' sports" like field hockey, started playing co-ed soccer in her 50s and loved it, but realized it was too easy to get hurt. After running a marathon in Paris in 2007 — "I wanted an excuse to go on a vacation," she says — she started training in earnest with the the Leukemia & Lymphoma Society's group, Team in Training, and has since run marathons in cities around the globe. A physical therapist, Peterson understands how strong muscles protect joints and has stayed injury-free. Now, as a coach with Team in Training, she reassures others that listening to your body is more important than sticking to a preset training schedule. "Runners just keep running when they hurt," she says. "If something hurts a little bit, I slow down, and if it still doesn't go away I take a break." When you ask runners why they keep lacing up their shoes and putting in the miles, they rarely mention the health benefits first. Instead, they're motivated by the joy of running and the network of fellow runners. Five and a half years ago, Swanson lost her husband, Jack — her training partner and travel companion — to leukemia. Running was therapeutic, she says, and provided a supportive community of friends. Swanson set her personal records in the early 1980s — "a long, long time ago" — and that's not what running is about these days. It's about being outside the first spring day in T-shirt and shorts, and watching for the flowers to bloom; seeing the seasons change and going out, even when the the weather is less than pleasant, for an adventure. Whether it's because of former injuries, chronic conditions or just a matter of preference, not every senior is going to run a marathon. And that's completely fine. The important thing is staying physically active in some way, and walking has huge benefits for those looking for a place to start. The American College of Sports Medicine guidelines for older adults recommend doing a moderate-intensity exercise — like walking — for 30 to 60 minutes most days, for a total of 2½ to 5 hours a week. Or, for vigorous exercise — like running — guidelines recommend at least 20- to 30-minute activities for a total of 1½ to 2½ hours each week. Resistance, flexibility and balance exercises are also recommended. Find more at acsm.org. To stay motivated for any level of physical activity, experts recommend exercising with a companion or group for the social component. Setting goals is also critical, and signing up to walk in an organized race is a good, concrete goal. Don't be surprised if you end up running at least part of the way. In many ways, speed is relative — if a 60-year-old woman and a 20-year-old man finish a race at the same time, her performance is a lot more impressive. But how do you compare? Many older runners and running organizations use "age grading" to place all participants on a level playing field based on the world record times for each age and gender. Similarly, the qualifying times for the Boston Marathon are based on age — a man under 35 needs to run a 3:05 marathon to qualify; a man in the 65-69 age group needs to run a 4:10 marathon. Find age-grading calculators online at runnersworld.com/tools/age-graded-calculator or howardgrubb.co.uk/athletics.